Ah. That's better. I wonder why the real estate agent didn't think of that? What's with all the stoves? I think they should all get together and live in Stove Happiness. 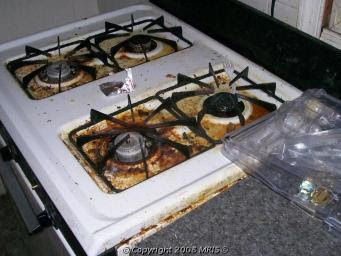 This stove could be that token friend from the wrong side of the tracks... the one they hang out with so they can feel better about themselves. Nice picture - makes me want to put the food I'm going to eat on that oven. I also noticed that the LP of the house went up $17 - I wonder what would have caused that - maybe they put out a roach trap to increase the value? Umm, okay; because now that times are tough you can scrape up all that yummy goodness and make a meal of it. Just think: serve with a side of RUST from the water heater, MOLD from the carpet, and garnish with TRASH from the floors. Mmmm-mmmm-good! Oh, wait. Since the TOILET has been winterized, whatever shall we have to slake our thirst? The listing says, "Needs everything," but it seems to have two refrigerators. Oh and very nice to provide a distance shot AND a close up of the one fridge. nordstrom24, I don't know where it makes me want to put the food I'm going to eat, but I do know where it makes me want to put the food I just ate! I am just wondering...why inclue the picture in the first place? Was it a warning for us from the realtor? "Hey look people, this stove represents the rest of the house. I am just giving you a hint you don't want to buy this thing. I don't want the blame when you live here." What in the heck is on those carpets - ewwwwwwww! Yuck! That makes my stomach turn! Well, at least the toilet is winterized. I am going out to the kitchen to clean something. Ugh. Who let Mr. Linnee in that kitchen to make dinner? I would've warned them he's a messy cook who never wipes the stove. That reminds me, I need to go now to run screaming from this room, clean my house and wash my eyes out with acid! Thank goodness someone put the lid down on the toilet. Charlene said "I don't know where it makes me want to put the food I'm going to eat, but I do know where it makes me want to put the food I just ate!" Stop! You can't puke in the toilet; it's been winterized! this is a great site. love looking at it during work. shh....how did you get that picture to shrink? Jennifer: I can shrink the photos, or make them larger, when I edit the post.